A hi-tech music system with an old school look. 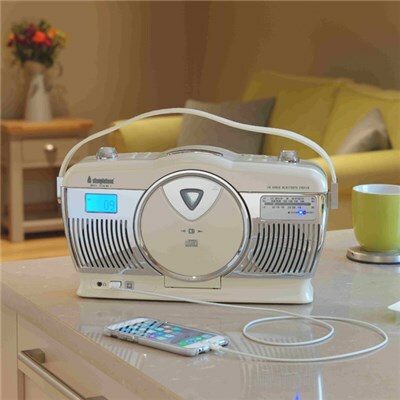 Available in two retro colours, this portable Radio and CD player will definitely keep you entertained. Our all new version of everyone's favourite Retro Radio and CD player is back. But this time with something new and very different. We have now added in Bluetooth Transmitting which will allow you to play your CDs though any Bluetooth speaker. With so many people having large CD collections, but not having a way to play them on Bluetooth speakers, this solves the problem for CD lovers everywhere. Developed technology in a retro form.Bluetooth Receiver, USB Charging Port for charging, Built-in Stereo Speaker and battery operated for portability.